1966年　"The Feel Of Neil Diamond"
1968年　"Velvet Gloves And Spit"
1969年　"Brother Love's Travelling Salvation Show"
1969年　"Touching You, Touching Me"
1977年　"I'm Glad You're Here With Me Tonight"
1978年　"You Don't Bring Me Flowers"
1981年　"On The Way To The Sky"
1986年　"Headed To The Future"
1989年　"The Best Years of Our Lives"
1993年　"Up On The Roof: Songs From The Brill Building"
1994年　"The Christmas Album 2"
1998年　"The Movie Album: As Time Goes By"
1977年　"Love At The Greek"
1987年　"Hot August Night 2"
1968年　"Neil Diamond's Greatest Hits"
1974年　"His Twelve Greatest Hits"
1976年　"And The Singer Sings His Songs"
1978年　"Early Classics Released on Neil's own record label, Frog King"
1982年　"His Twelve Greatest Hits Vol. 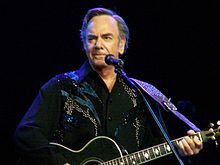 2"
1983年　"Classics: The Early Years"
1999年　"The Best Of The Movie Album"
1999年　"20th Century Masters - The Best of Neil Diamond"
2002年　"Play Me: The Complete Uni/MCA Studio Recordings...Plus!" 1976年　"Love At The Greek"